The Festival of Lights is a once in a lifetime opportunity for visitors to see Lyon’s beautiful monuments and historic sites before the evenings’ celebrations and light shows. Tourists can discover the city landmarks in unusual ways without worrying about subway lines, bus stops or directions they must go. That’s real luxury. 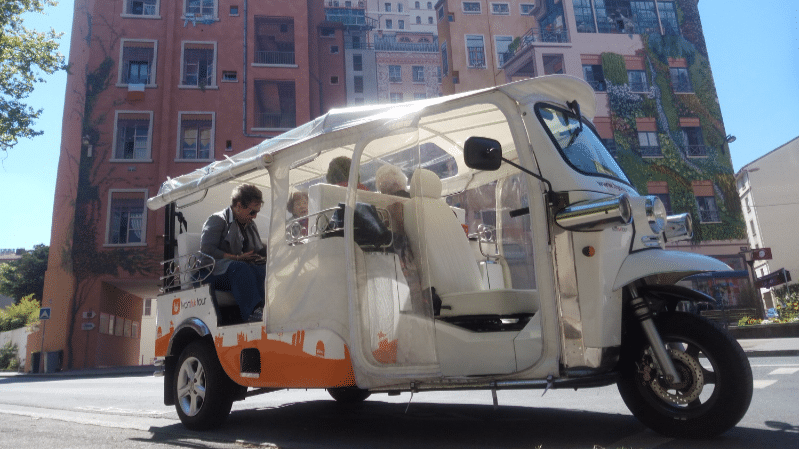 Renting an electronic tuk tuk is a fun and unconventional way to visit Lyon with friends or family folks without any effort to produce. Enjoy the ride, take pictures (and selfies) admire the views while hearing stories about Lyon’s glorious past. Lyon Tuk tour at the Croix-Rousse. On top of that, seaters are not disturbed by rain showers thanks to a transparent tarpaulin covering the vehicle. The one-hour private tour leads visitors to the city’s famous squares (Bellecour, Jacobins, Terreaux, Republique) and the Saone banks. If you want to know more about the hill that prays (Fourviere) and the hill that works (Croix Rousse), choose a 2-hour tour. Book your Tuk Tuk Tour. Departure Time: every day at 10am, 1pm, 4pm (3pm for the 2-hour tour). Location: 3, Saint-Jean Square (Subway D Vieux-Lyon). Lyon has become a bikers-city in recent years with its affordable easy-to-use bike rental service. However, some bicycle enthusiasts are not ready to give up their old-fashioned and colored Solex moped just yet (the famous French manufacturer sold over 7 million motorized bikes between 1946 and 1988). Brélon de Lyon gives nostalgic visitors the opportunity to visit Lyon by renting a restored Solex with a jet helmet and a bicycle bag. They also have the privilege to ride on the roadway as well as on cycling paths. Several guided tours are proposed to discover Croix-Rousse hill and its slopes or the city’s main squares. There is also a brunch tour with a gourmet break. Riders can also choose their own itinerary stop by their favorite café or restaurant and drop the bike at a different location. 20, Rue Burdeau – Lyon 1 (Subway Hotel de Ville A, C or Croix-Paquet C). Opening Hours: 9am-Noon / 3pm-7pm (Tuesday to Saturday). Fares: Croix-Rousse tour (35 Euros – 90 minutes), Croix-Rousse to Bellecour tour (45 Euros – 2 hours), Brunch tour (50 Euros – 2h30). If you see a blue or yellow Volkswagen Kombi parked in a street where most first-time visitors almost never go, this might not be an abandoned vehicle, nor a travel trailer. Enjoy visiting Lyon with VW Kombi. 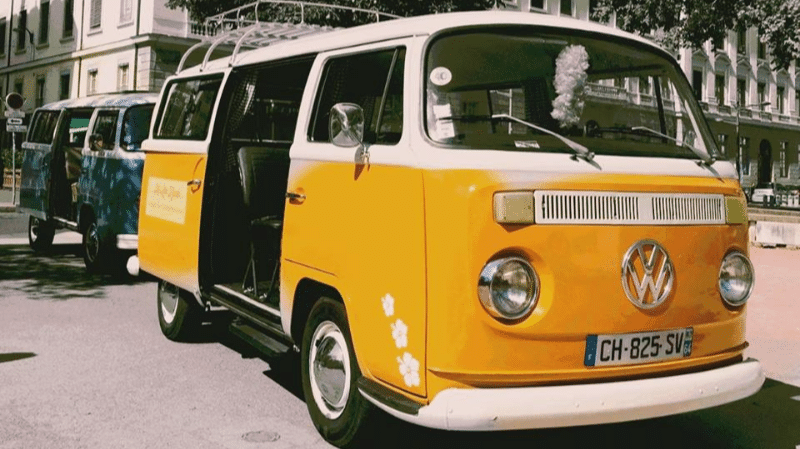 “Pitchoune”, as the legendary vintage minivan is called, is an increasingly popular means of transportation among tourists looking for an authentic experience as they visit Lyon. My Little Kombi proposes a 2-hour off-the-beaten-track tour across town to (re)discover Lyon through unusual stories told by a local driver. The company also provides shuttle service from or to the airport (or to the train station) on weekdays (59 Euros) and wine trips to the nearby vineyards (Northern Rhone Valley, Beaujolais) which include tastings (59 Euros per passenger). December 7-10 – 10am and 2pm (2-hour tour) – 35 euros per passenger (up to 7 passengers). Lyon’s attractiveness among foreigners has a lot to do with fine cuisine and the number of local food specialties. 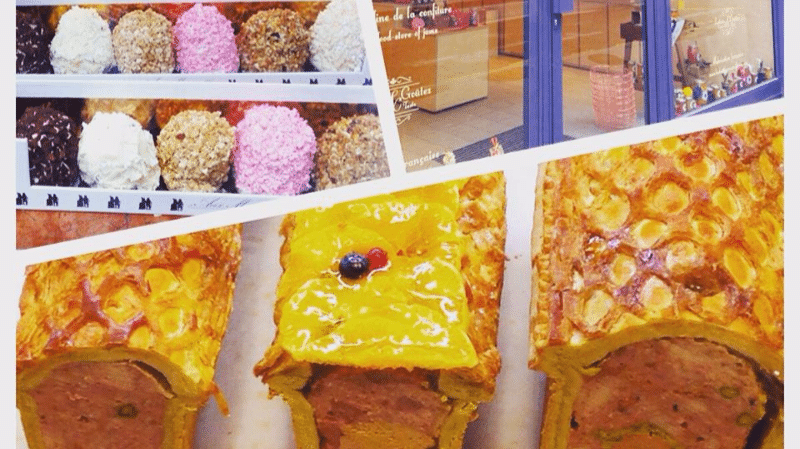 Gourmet visitors can taste eight of these culinary delicacies from cold cuts to quenelle, cervelle de Canut (cheese spreads) and pink praline pies in a 2-hour tour while learning about the local food history. Praline and Rosette’s passionate guide tells anecdotes about the local peanut and famous female chefs like the Mère Brazier, France’s first woman to get three Michelin stars. Fares: 29/39 Euros depending of the tour you choose. The Wagon bar looks like any double-decker sightseeing bus with one exception: the upper floor is a dining room where passengers taste fine wines and gourmet dishes made by Jérémy Galvian, a local chef who got his first Michelin star in 2017. 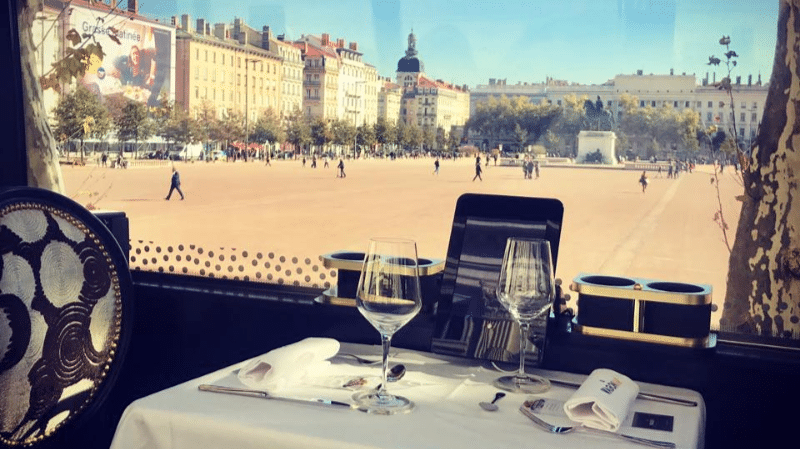 The 3-hour culinary journey gives gourmet visitors the opportunity to visit Lyon with the help of an iPad application that localizes the city monuments while listening to jazz music. If you want to come for the view, reserve a gourmet lunch. If you want to come primarily for the food and the city lights, reserve a gourmet dinner. The Wagon Bar will drive on the left bank of the Rhone river because of road closings in the city center during the evenings’ festivities. Departures: Noon (lunch) and 8pm (dinner) from Bellecour square.